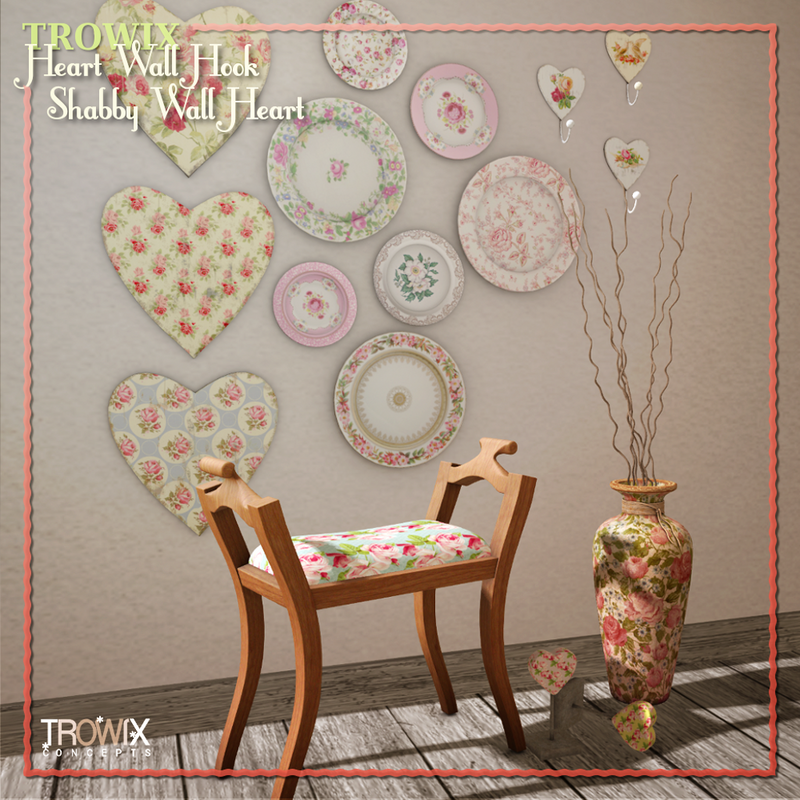 A puffed heart holds your square-format pictures in this carefully crafted wall frame. 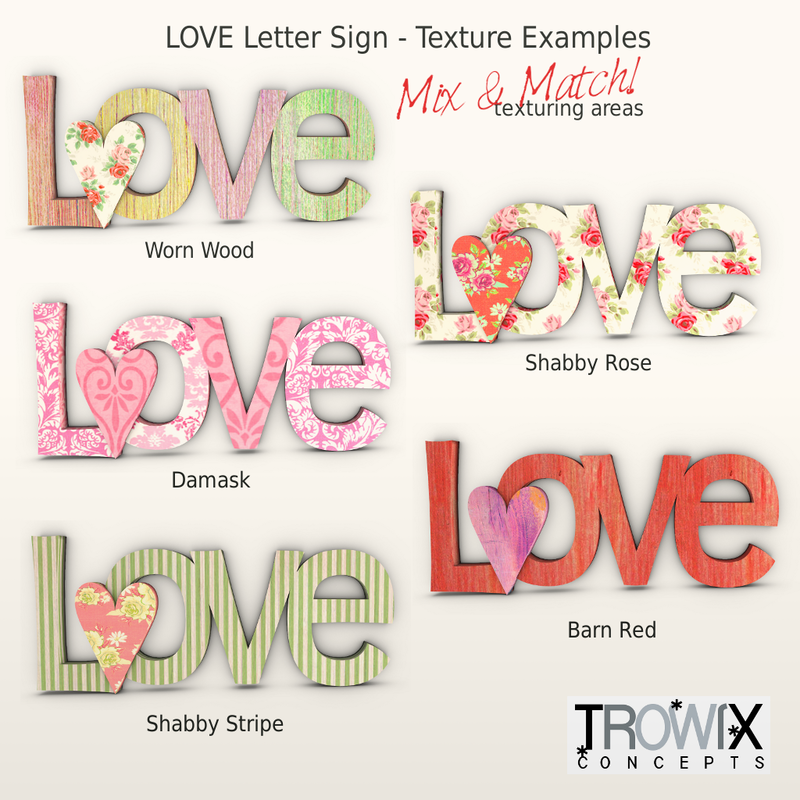 Show everyone who you love with our textures or yours. 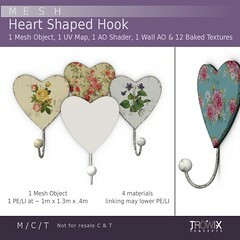 Original mesh made just for SL. [ 1 PE at ~ 1.3m x .13m x 1.2m] Plenty large for displays and event use. 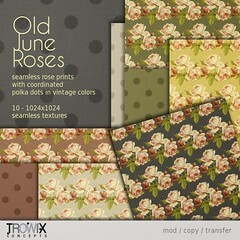 See this at the Trowix Main Store. Put a little love in your life! 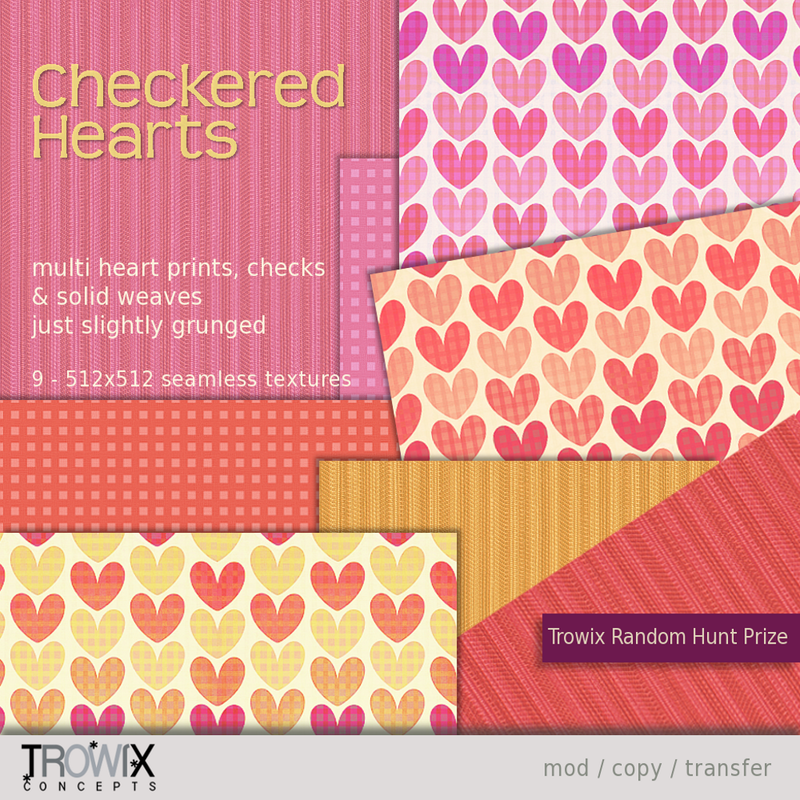 Random Hunt Game – New Prizes! We’ve cooked up (and scripted) a new game for you! With PRIZES! We can now have a hunt going in the store all the time. The hidden hunt item has, at least, two things inside. Find it and click on it. You will receive one random prize. After you’ve gotten your gift, the hunt item will randomly hide itself in another place in the store. Hunt again to receive another random prize. Play as many times as you like. There really aren’t any rules other than our TOS applies to prizes. 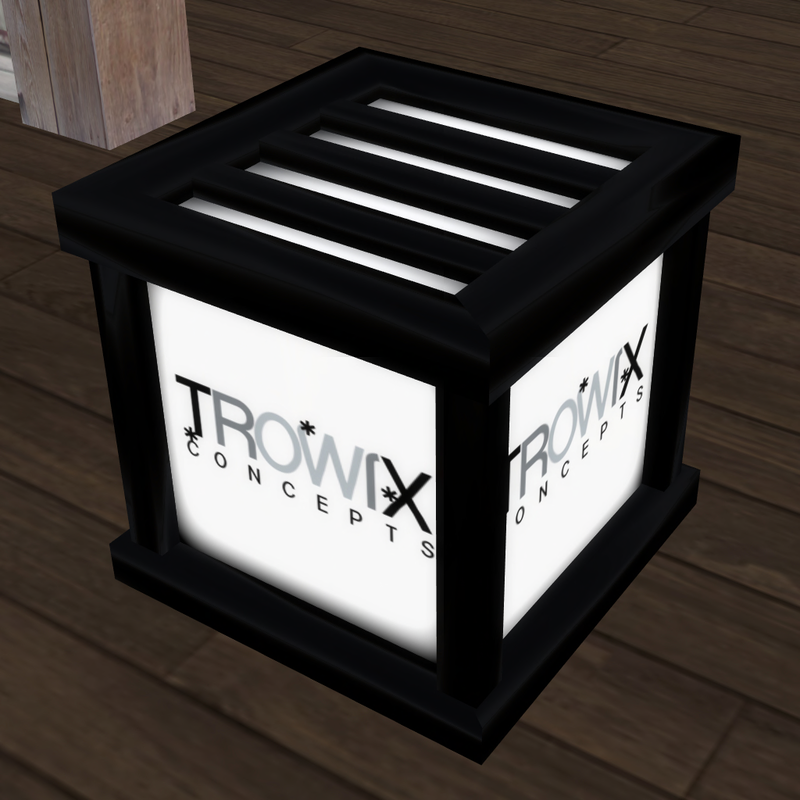 It is, however, Trowix Concepts in-world group only. 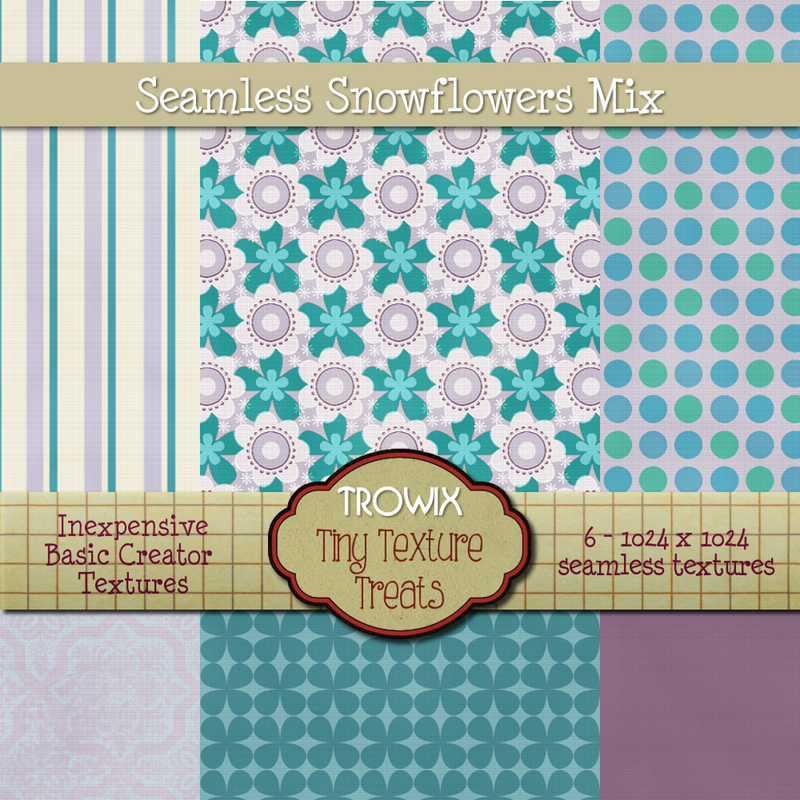 New prizes this week are brand new seamless texture packs. Join our Group! Get discounts on new releases. …and hunt prizes, of course. 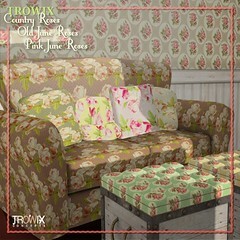 You can find our hunt at the Trowix Main Store. 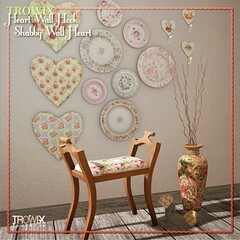 There’s a lot to like at Trowix! 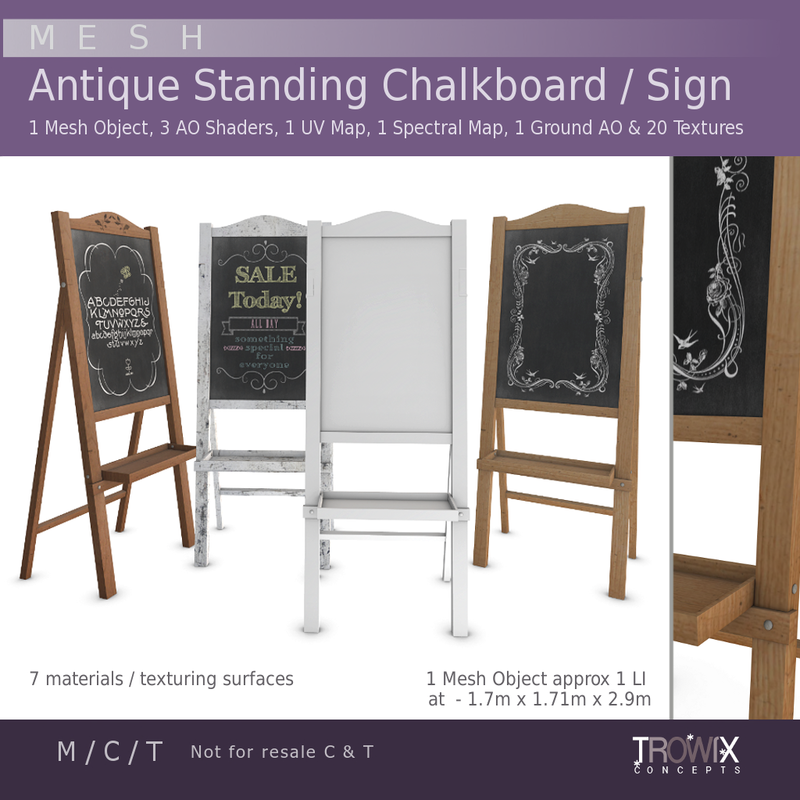 Antique Standing Chalkboard and Sign – Want! 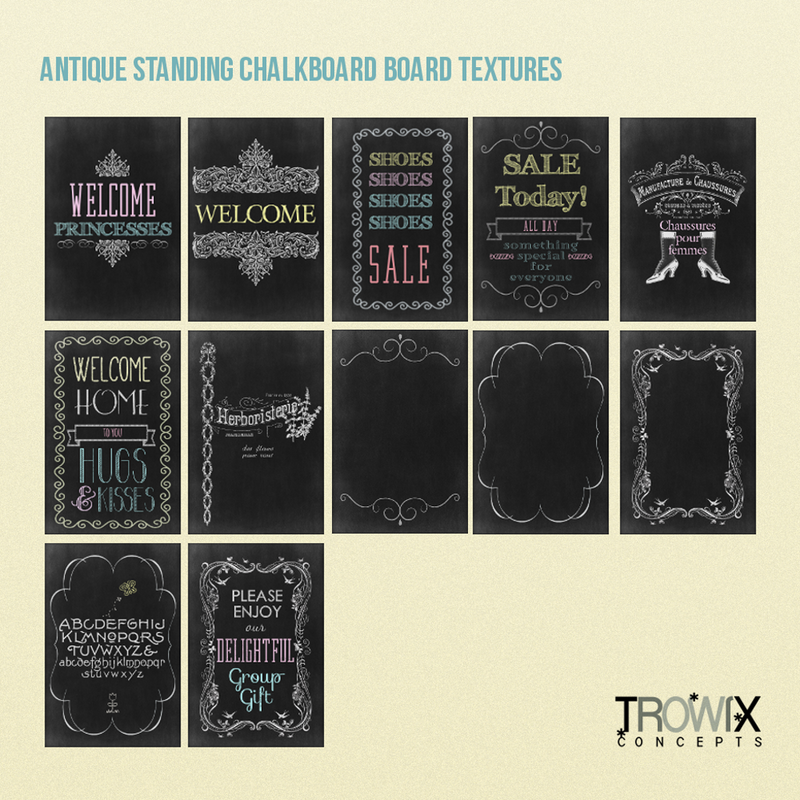 An old-fashioned standing chalkboard is just the thing for your store, club, event display – so very useful! 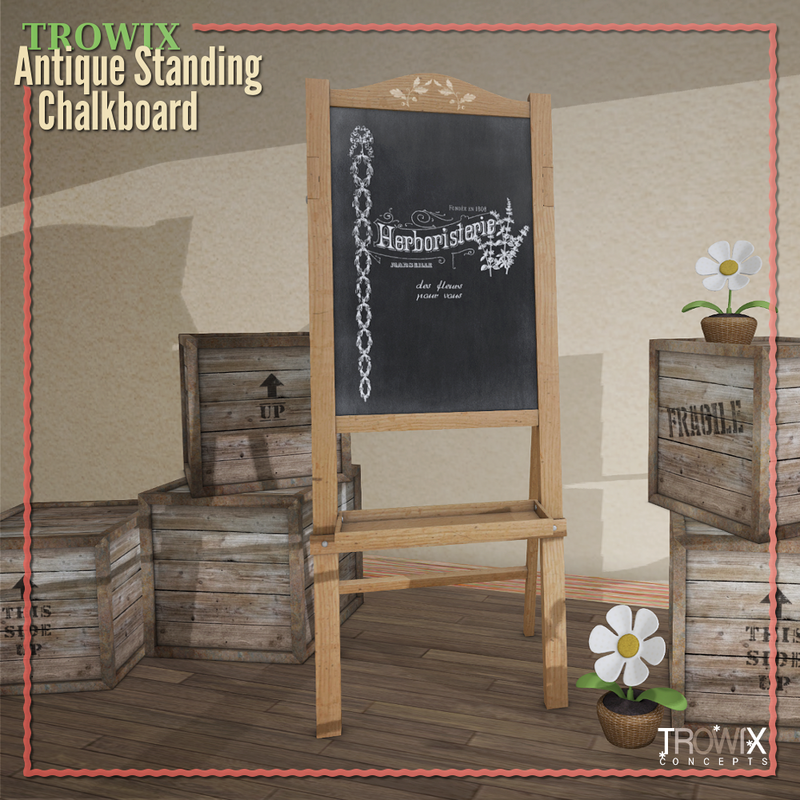 We’ve made this detailed, but super low prim, with the great LOD you expect from Trowix items. 1 LI for most applications or normal use sizes. 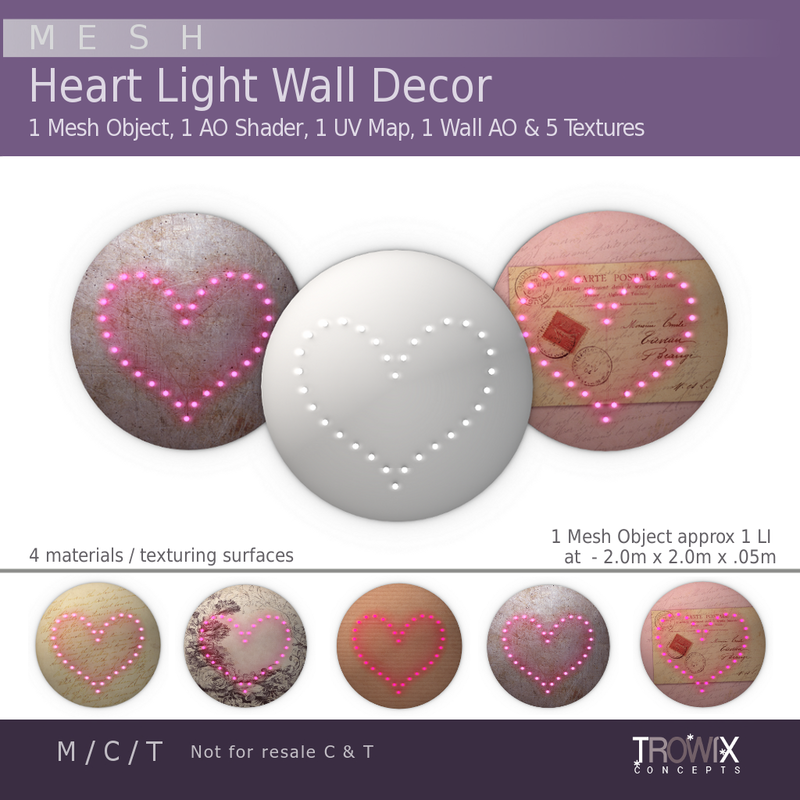 Tons of pre-made textures included or texture in-world or in your favorite photo editing program – we’ve included everything you need – UV, Spectral & AO maps. 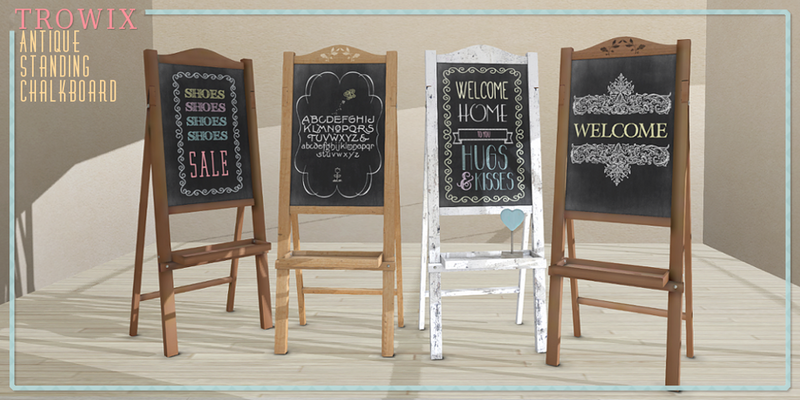 Also available on Second Life Marketplace, here. Chalk it up to cute! 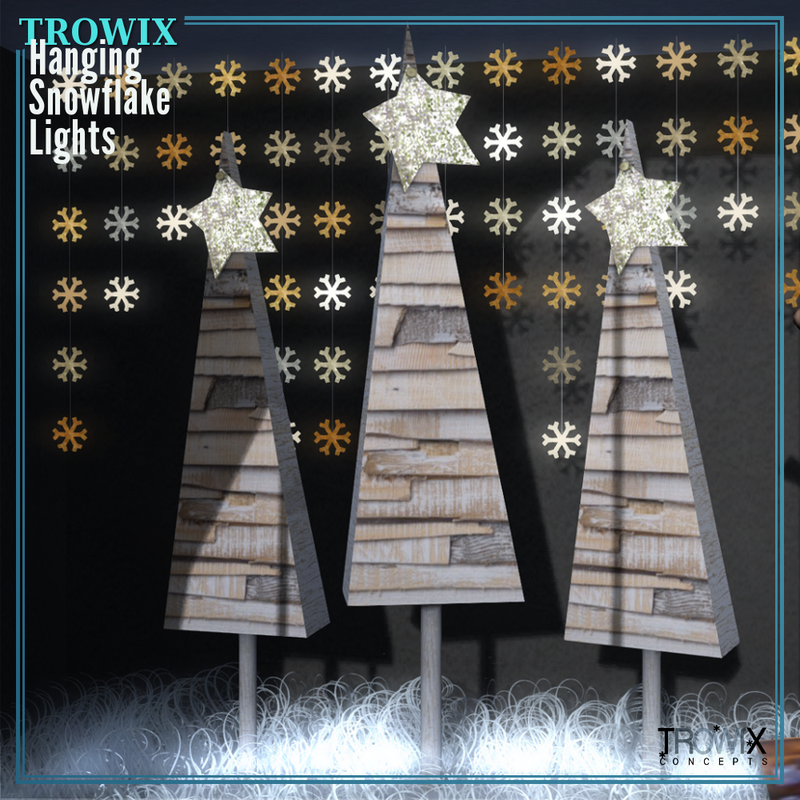 Snowflake String Lights – Sparkly Displays! 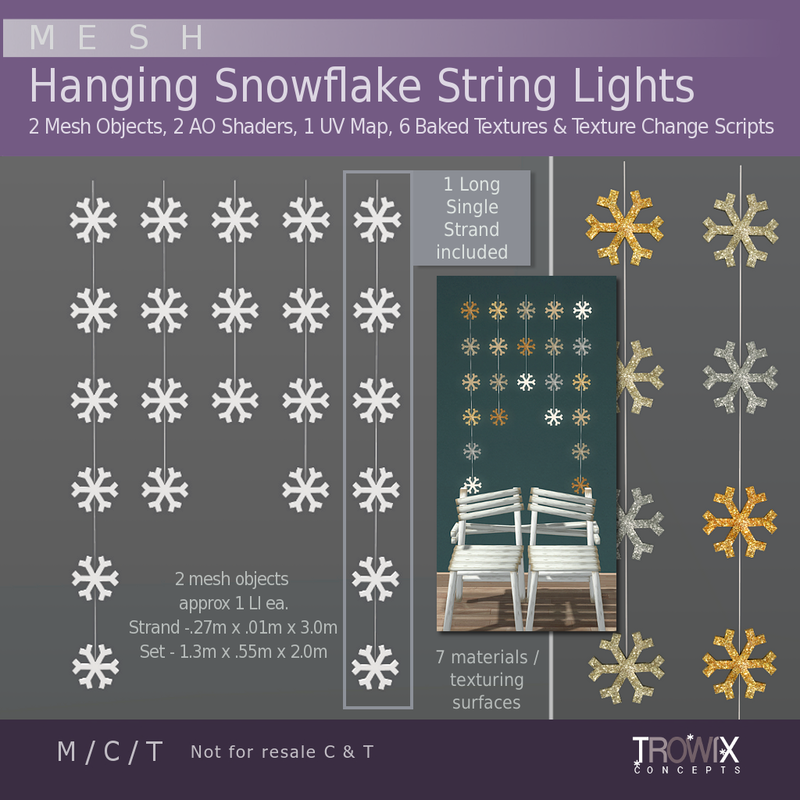 Detailed, darling snowflakes in original mesh – string lights to give your Winter builds and displays added realism, excitement, color and sparkle. 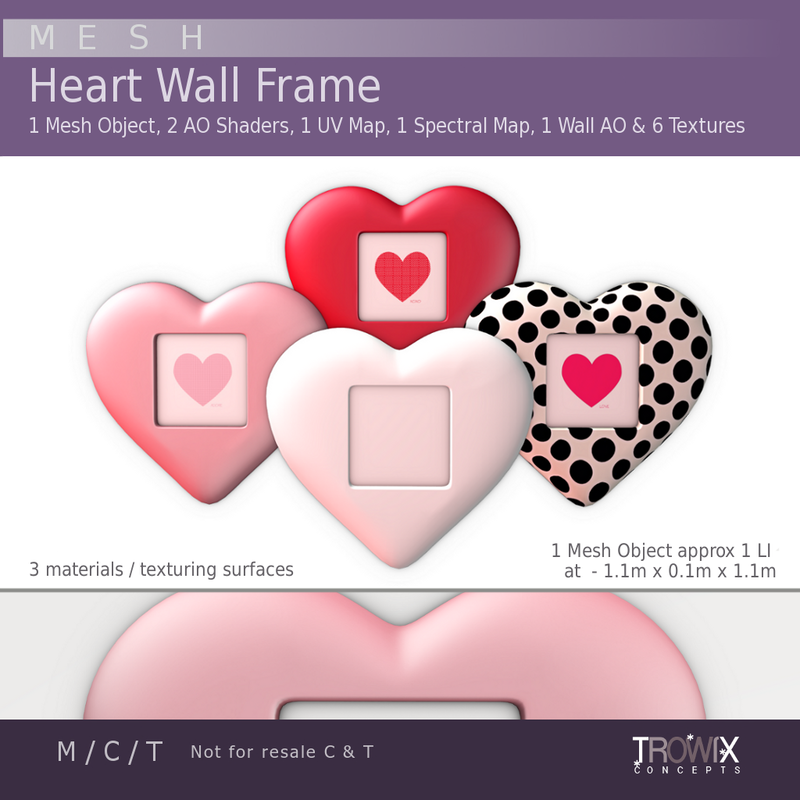 These meshes have extremely low prim equivalency (PE or LI). 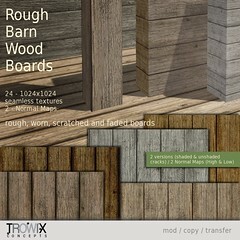 Inworld, 7 materials make tinting and texturing simple and fun. 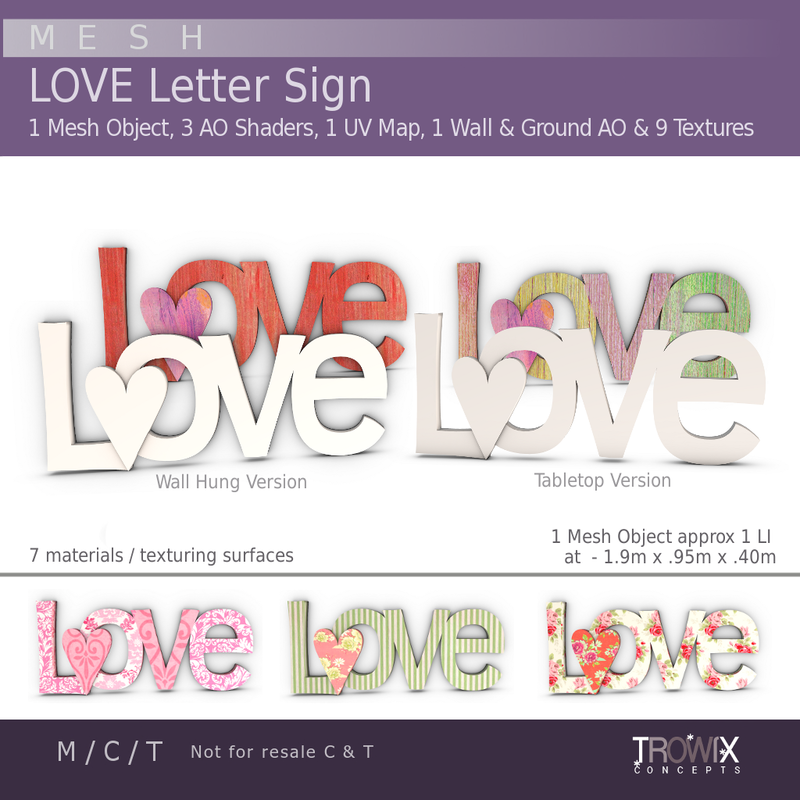 We have included a “chasing light” texture changing script with color examples. 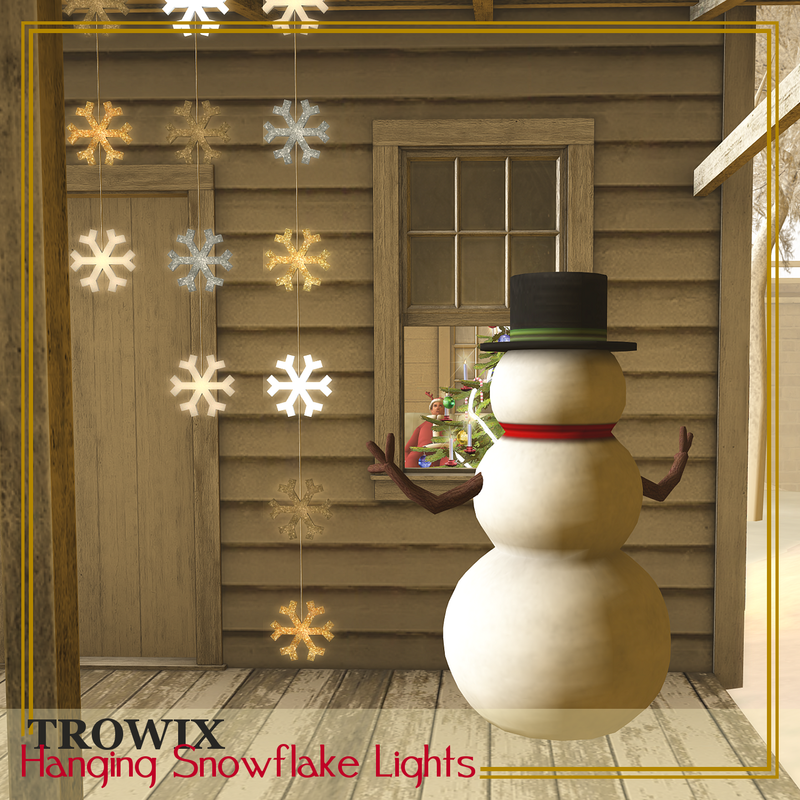 Our script: Trowix Concepts has included texture changing scripts for “Hanging Snowflake String Lights” as a building convenience only, we do not support edited versions of this script. Please set glow and full bright numbers in the texture tab of your building window. Don’t forget each texture surface! 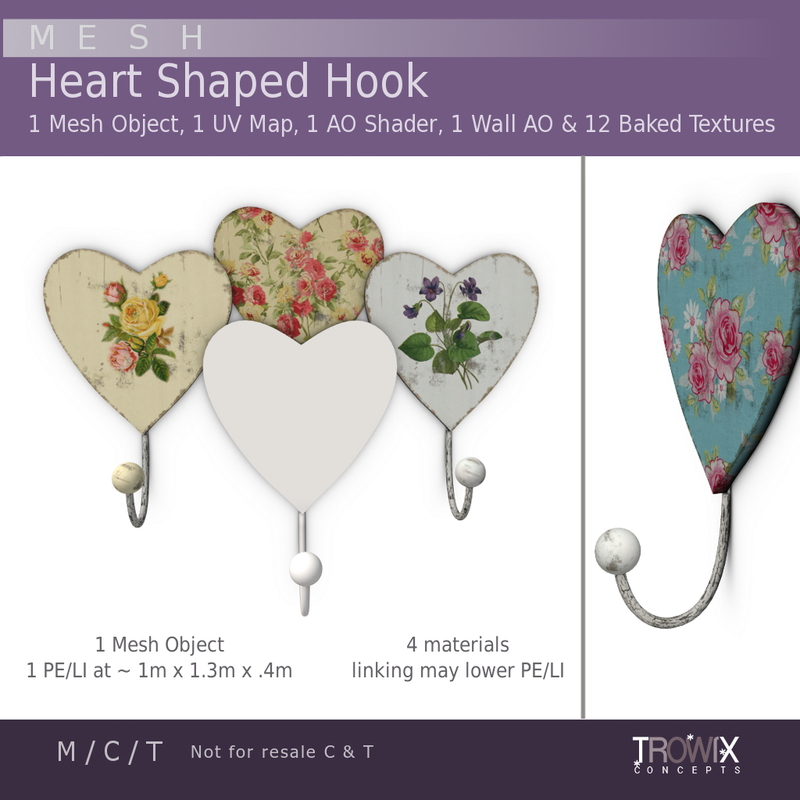 and available on Second Life Marketplace, soon. 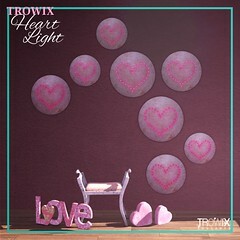 Make it sparkle with Trowix! 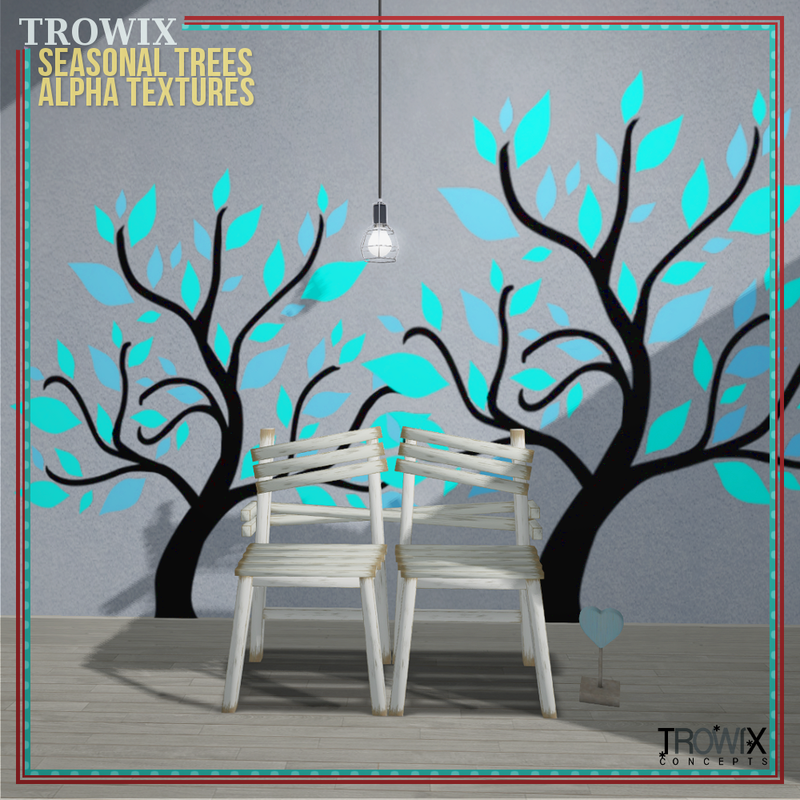 Seasonal Trees Alpha Textures – Perky Walls! 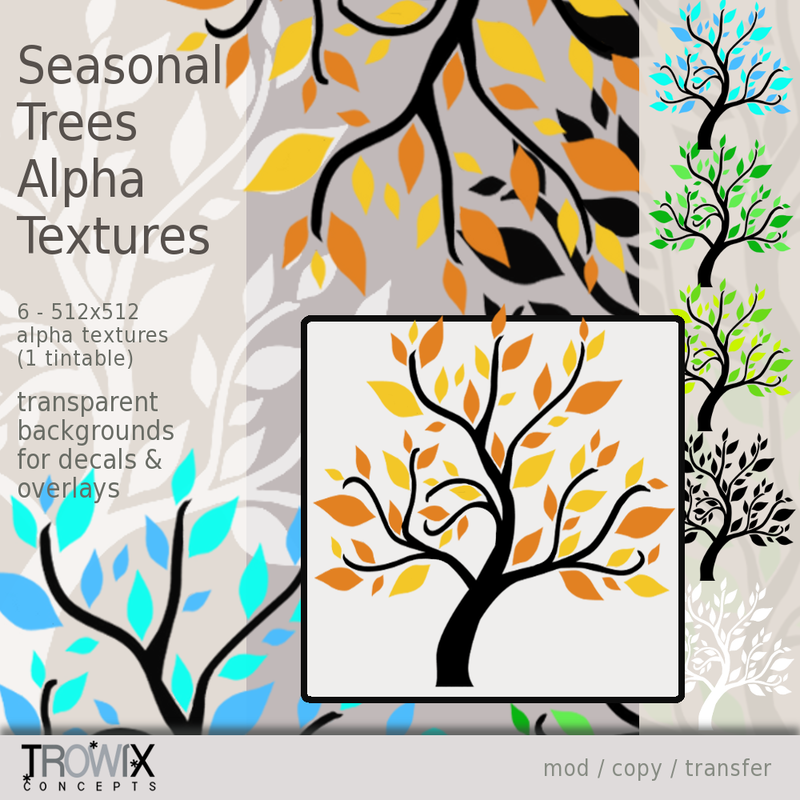 A fun stylized tree in seasonal colors and, also, black and white for tinting. 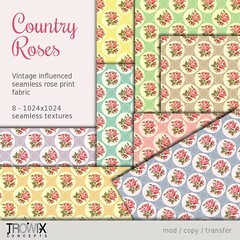 These are great for making trendy wall decals and backgrounds. Please note: these have a transparent alpha channel and may not be suitable for all building applications. 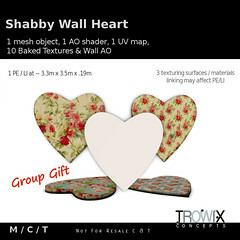 Easy fun way to decorate your walls and displays! 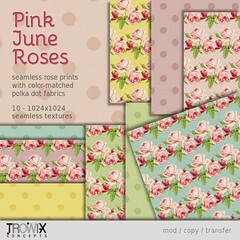 These are cute with our “Feather Leaf” print textures. on Second Life Marketplace – here. 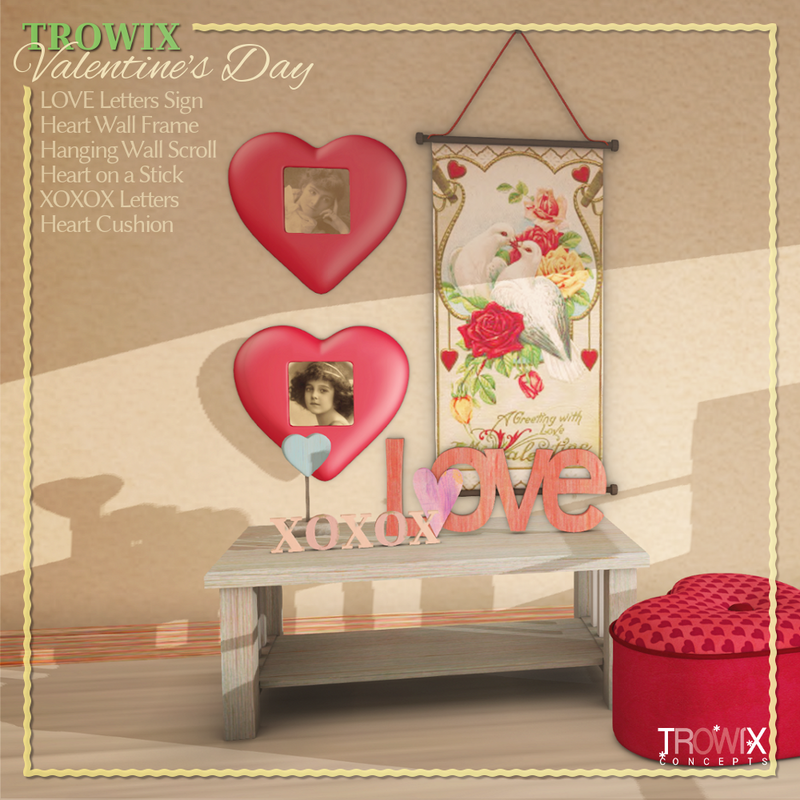 Make it all pretty with Trowix!